What's a gal to do when she picks up two enormous jars of peanut butter at Costco? Put a dent in the gallons and gallons of PB by making peanut butter cookies, that's what. John has been up in Connecticut visiting with the fam (I stayed behind because plane tickets cost as much as a Birkin bag....lame), so I made a batch to welcome him home today. Nothing says "I love you and freaking missed you like woah" like warmed homemade cookies and a cold glass of (almond) milk. 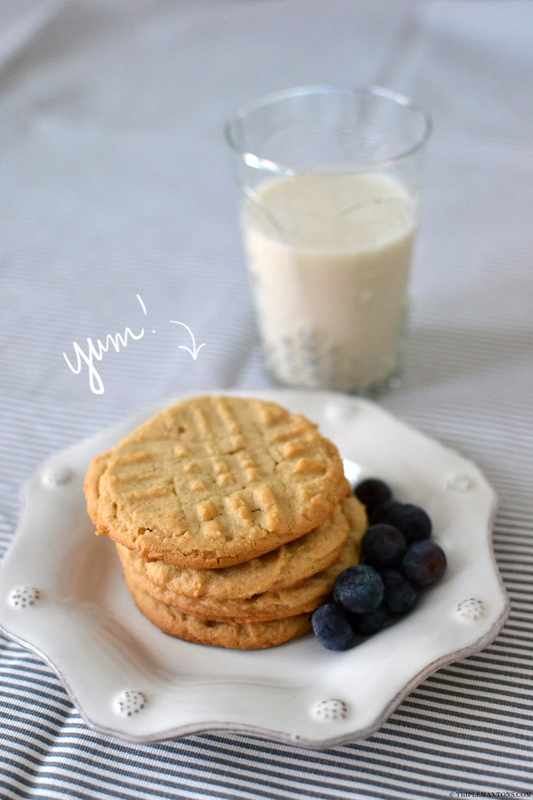 I also like pairing these cookies with berries....it's kinda like a dessert version of PB&J. 1. Beat the butter until creamy, 2 minutes. Add the sugars, beat for 2 more minutes. Mix in the peanut butter and egg. Mix together the dry ingredients - flour, baking soda, baking powder and salt. Stir the dry ingredients into the sugar butter mixture. 3. Preheat oven to 375°F for cookies with a bit of crunch, or 300°F for chewier cookies. 4. Shape dough into 1 1/4 inch balls (I used an ice cream scoop). Place about 3 inches apart on ungreased cookie sheet. Flatten in crisscross pattern with a fork. Bake until light brown at 375°F for 9 to 10 minutes, or at 300°F for 15 minutes. 5. Cool on baking sheets for a minute; transfer to rack to cool completely. I'm such a sucker for peanut butter cookies, and these look damn delish! where was john visiting in CT btw (if you don't mine my asking)? my fiance is from brookfield!